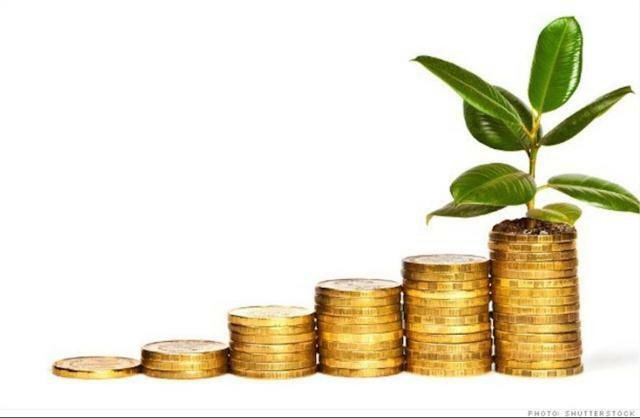 “The Safest Dividend Is The One That’s Just Been Raised”. Now keep in mind, there are quite a few other things that I like about TRTX and the purpose for this article is to open up the hood again and determine how the company performed in Q1-18. In addition, I need to evaluate this commercial mortgage REIT alongside the closest peers in an effort to determine whether or not I will maintain my current BUY recommendation. As you can see (above), TRTX has been a great pick and I am so glad that I took the time to include this new REIT in our research. While many of our traditional equity REITs have lagged YTD, TRTX and Ladder Commercial (NYSE:LADR) have proven to be excellent names to own. While dividend growth is not expected for most commercial mortgage REITs, LADR and TRTX have demonstrated their worth by providing investors with sizable boosts of confidence. 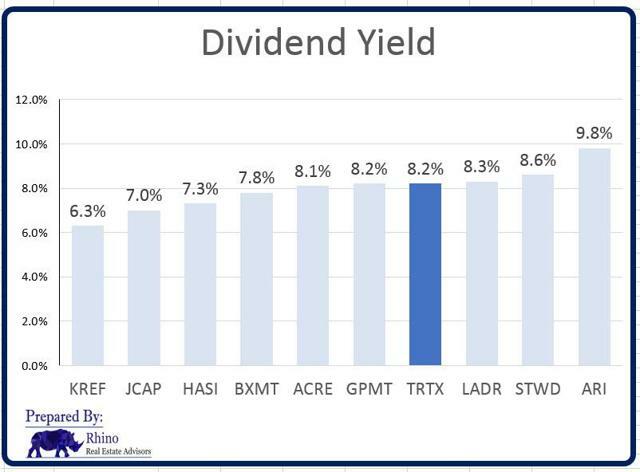 It should be no surprise that a company’s price performance is oftentimes directly correlated to dividend growth. TRTX was incorporated in October 2014 and commenced operations in December 2014 with $713.5 million of equity commitments from seven third-party investors, many of which have significant investment relationships with funds sponsored by TPG, and $53.7 million from TPG affiliates. In December 2014, the company acquired a controlling interest in an initial portfolio of commercial real estate loans representing $1.9 billion of unpaid principal balance and an additional $635.9 million of undrawn loan commitments. The company funded the purchase with proceeds from an initial share issuance to the initial investors and match-indexed seller financing structured as a non-recourse collateralized loan obligation. TRTX operates its business as one segment which directly originates and acquires commercial mortgage loans and other commercial real estate-related debt instruments. The company made an election to be taxed as a REIT for U.S. federal income tax purposes, commencing with its initial taxable year ended December 31, 2014. TRTX is externally-managed, since inception it has been managed by TPG RE Finance Trust Management, L.P., an affiliate of TPG. The company’s senior leadership team is comprised of TPG employees and is led by Greta Guggenheim, CEO and president, and partner of TPG. Interesting to see that Ms. Guggenheim was also a co-founder of Ladder Capital and was president of Ladder from its formation in October 2008 through June 2012, when she was appointed chief investment officer. TPG is a leading global alternative investment firm founded in 1992 with over $72 billion of assets under management as of December 31, 2016. 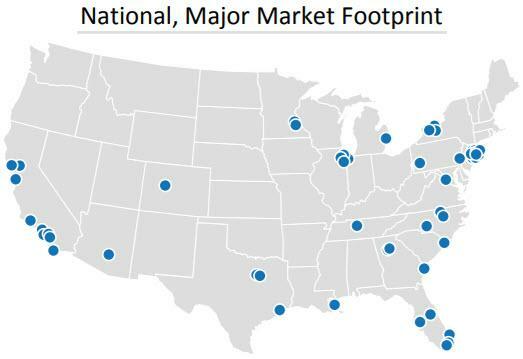 TPG currently has over 500 investment and operating professionals based across 17 offices worldwide, including San Francisco, Fort Worth, New York, Boston, Dallas, Houston, Austin and London. TPG operates a global alternative investment platform that encompasses private equity, private credit and real estate. So, as you can see, TRTX has deep experience in sourcing commercial real estate loans and two of the senior management executives were formerly affiliated with Ladder. Commercial Mortgage Loans.We intend to continue to focus on directly originating and selectively acquiring first mortgage loans. These loans are secured by a first mortgage lien on a commercial property, may vary in duration, predominantly bear interest at a floating rate, may provide for regularly scheduled principal amortization and typically require a balloon payment of principal at maturity. These investments may encompass a whole commercial mortgage loan or may include a pari passu participation within a commercial mortgage loans. TRTX’s portfolio currently consists of predominantly floating rate first mortgage loans secured by multi-family, hotel, office, industrial, condominium, mixed use, retail and other assets. TRTX originates and acquires large (> $50M) floating rate, commercial mortgage loans on properties in transition (12-24 months). Although externally-managed, the company benefits significantly from the relationship with TPG generally through the firm’s extensive network of relationships, its deep capital markets experience, its demonstrated capital stewardship and its commitment of resources to the Manager. 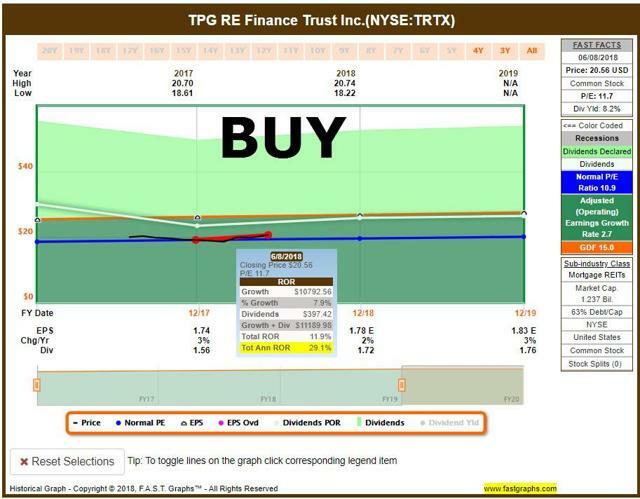 TPG’s broad-based experience and reputation as an alternative asset management firm benefit the REIT by providing access to off-market origination and acquisition opportunities, as well as the Manager’s and its affiliates’ market expertise, insights into macroeconomic trends and intensive due diligence capabilities, all of which help discern broad market conditions that frequently vary across different markets and credit cycles. 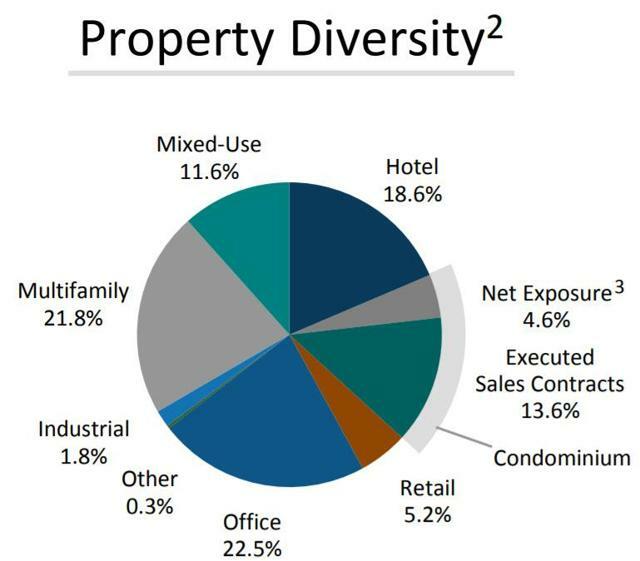 TRTX’s preferred asset type is multifamily, particularly workforce housing given strong supporting demographics in this income cohort and a relative shortage of supply. The multifamily sector is highly stable, and it’s much less volatile than other property types during the recession. Affordable and workforce housing experiences little new supply, and TRTX finds the supply-demand dynamics of this sector highly attractive and the company anticipates continued penetration in the multifamily sector. TPG’s substantial equity investment in the REIT strongly aligns its interest with the interests of stockholders. TPG and its affiliates beneficially own approximately 12.3% of the outstanding stock and three of the REIT’s seven directors are partners of TPG. The REIT also benefits significantly from relationships with TPG Real Estate Partners, TPG’s real estate equity investment platform, which has more than $5.5 billion in assets under management and employs 27 professionals across TPG’s New York, San Francisco and London offices. TPG Real Estate Partners focuses primarily on investments in companies with substantial real estate holdings, property portfolios, and select single assets primarily located in North America and Europe. Employing a value-add approach to investing, TPG Real Estate Partners leverages the full resources of TPG’s global network to optimize property performance and enhance platform capabilities. Through its investments in various real estate operating platforms, including, without limitation, Parkway Properties (PKY), Taylor Morrison Home Corporation (TMHC), Evergreen Industrial Properties, Strategic Office Partners and Cushman & Wakefield, TPG Real Estate Partners provides direct insights to help inform views on specific markets, economic and fundamental trends, sponsors, property types and underlying commercial real estate values. In summary, I consider TRTX similar to Blackstone Mortgage Trust, except that TRTX makes smaller loans ($50 million+) and focuses just on US assets. Both REITs are predominantly senior-secured lenders which makes the business model much simpler to understand. TPG (external manager) has established a thorough and disciplined credit culture, reflected in the process through which each investment is evaluated, that takes a bottom-up, equity-oriented approach to property underwriting. 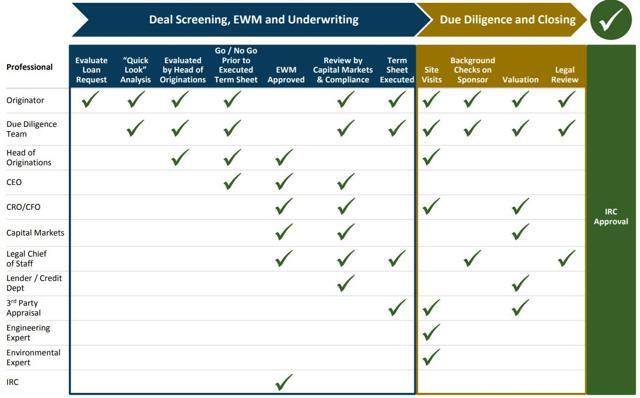 As part of the underwriting process, the Manager performs detailed credit and legal reviews and borrower background checks and evaluates each property’s market, sponsorship, tenancy, occupancy and financial structure, and engages independent third-party appraisers, engineers and environmental experts to confirm underwritten property values and assess the physical and environmental condition of the loan collateral. Prior to closing on a loan, the Manager’s deal team inspects each property and assesses competitive properties in the surrounding market. The Manager’s process culminates with a comprehensive review of each potential investment by the Manager’s investment committee. For Q1-18 TRTX’s asset level leverage, defined as borrowings divided by the unpaid principal balance of loan investments, rose to 71.3% from 65.1% in the prior quarter. The CLO, which is levered at 80%, was a big driver, but so were higher advance rates in a number of newly originated loans. 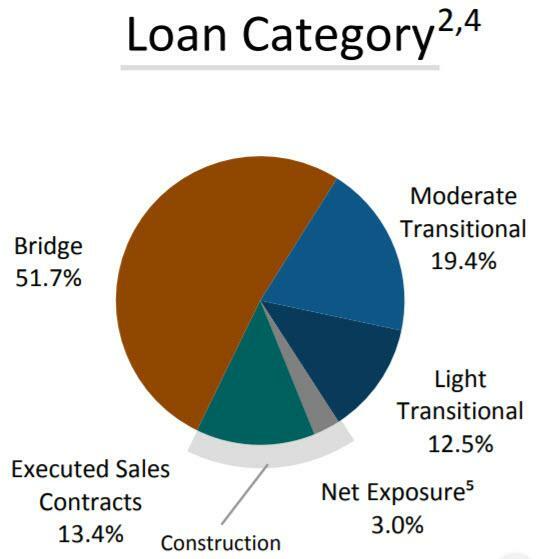 For loan investments pledged during the first quarter, the lender-approved weighted average advance rate was 77%. 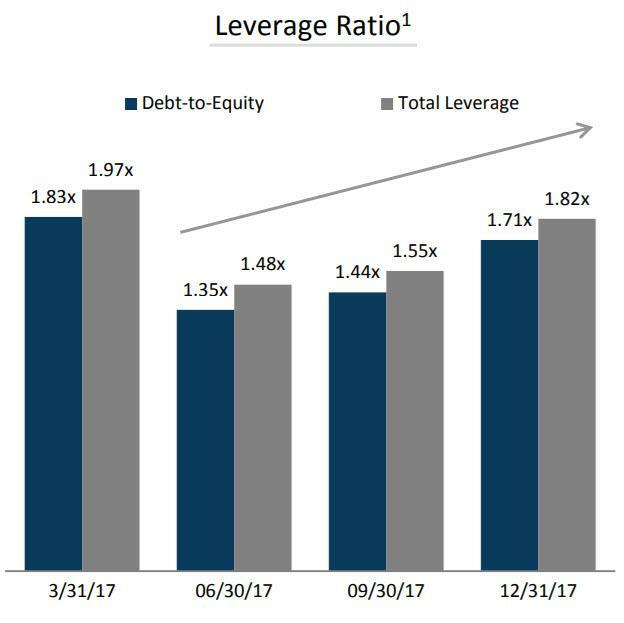 TRTX’s debt-to-equity ratio rose to 2.14:1 from 1.71:1 during the previous quarter, another clear indication of the prudent application of increased leverage as a key ingredient of the company’s strategy. Using the momentum of recent CLO, TRTX is aggressively pursuing differentiated ways to further reduce cost of funds, extend the maturity of liabilities and enhance the flexibility needed to remain a leader in the transitional lending space. For the $579 million of new loan originations in Q1-18, the weighted average credit spread was 376 basis points as compared to 418 for Q4-17. For the entire portfolio, the comparable measure is 452 basis points. Loan repayments in Q1-18 totaled $156.2 million in line with expectations and a meaningful share of loan repayments for the remainder of 2018 will be driven by accelerating repayments of the condo construction loan portfolio, where TRTX has virtually no net exposure. In terms of investment capacity, at quarter-end, TRTX’s liquidity and capital position was strong. 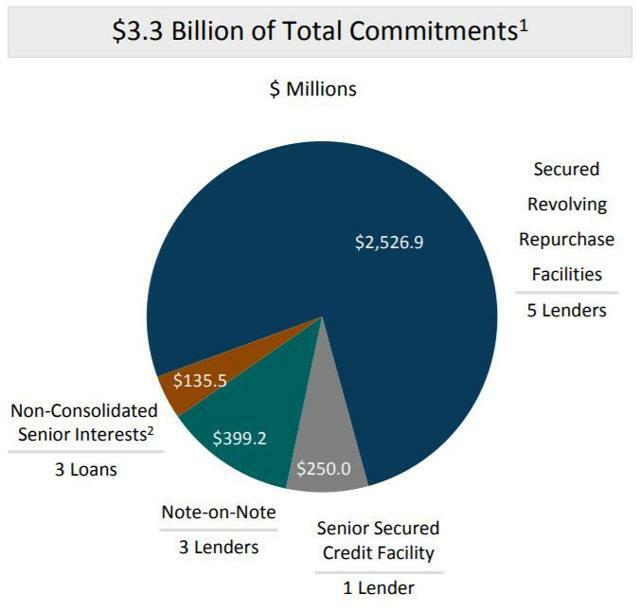 In addition to cash balances of $74.4 million, the company has $1.2 billion of available financing capacity under its five secured repurchase facilities and one secured warehouse facility for a total of almost $2.8 billion of commitments. TRTX recently amended all of its primary borrowing arrangements to harmonize the financial covenants. The principal impacts were: (1) a reduction in minimum liquidity from a hard $50 million requirement to the greater of $10 million or 5% of recourse indebtedness. (2) TRTX also negotiated for an increase in allowable total leverage from 3 to 3.5:1. Assuming asset leverage – level leverage of 3.5:1, TRTX’s estimated potential new loan investment capacity based on current capitalization and no loan repayments is approximately $1.2 billion. TRTX’s weighted average risk rating of the portfolio at quarter-end was 2.7. The company had no loans on non-accrual status nor were any impaired. Consequently, TRTX did not record a reserve for loan loss in the quarter nor has since inception. “I’m very much a follower of Howard Marks letters, and I do believe in times like this, you do not stretch on deals. And we’re very disciplined with that, but we are still able to have a very robust pipeline with already, for this quarter, $650 million of loans that are likely to close in the next couple of weeks. There you have it, TRTX is a solid commercial mortgage REIT and I like the simplicity of the platform. Given the substantial experience of the management team this REIT should be able to maintain a consistent platform, while maintaining a sound risk profile. The 8.2% fits squarely in our Durable Income Portfolio and we are maintaining a BUY. 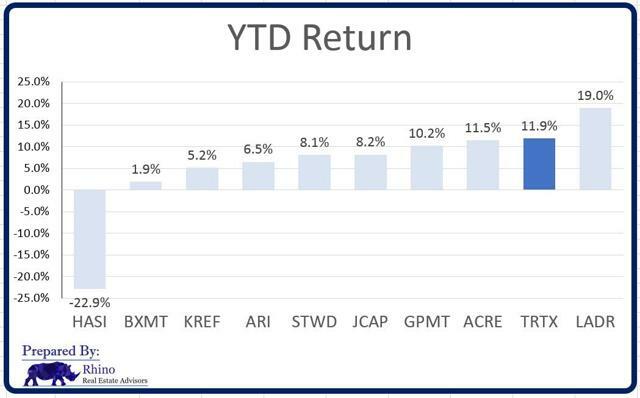 Other REITs mentioned: (KREF), (JCAP), (HASI), (ACRE), (GPMT), (STWD), and (ARI). 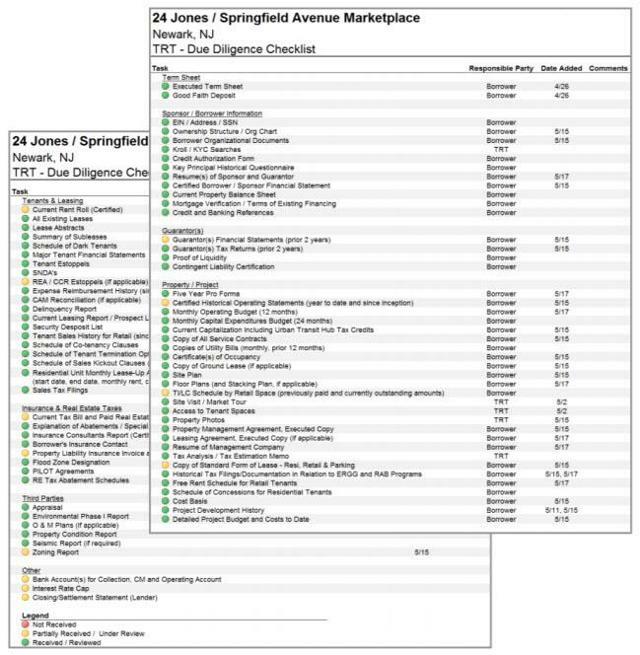 All Strong Buy picks can be viewed in my Marketplace service (The Intelligent REIT Investor). Source: FAST Graphs and TRTX Investor Presentation. Disclosure: I am/we are long ACC, AVB, BHR, BRX, BXMT, CCI, CHCT, CIO, CLDT, CONE, CORR, CTRE, CUBE, DEA, DLR, DOC, EPR, EXR, FRT, GEO, GMRE, GPT, HASI, HT, HTA, INN, IRET, IRM, JCAP, KIM, KRG, LADR, LAND, LMRK, LTC, MNR, NNN, NXRT, O, OFC, OHI, OUT, PEB, PEI, PK, PSB, PTTTS, QTS, REG, RHP, ROIC, SBRA, SKT, SPG, STAG, STOR, TCO, TRTX, UBA, UMH, UNIT, VER, VNO, VNQ, VTR, WPC.. When it comes to hunting for value in the technology sector, those two concepts – tech and value – seem to be irreconcilable. And while this is true of most of the sector, it’s not true of memory stocks; and within the memory sector, one name screams value more than any other: Micron Technology (MU). I’ve been a longtime bull on Micron, especially after the company’s recent upward guidance revision to Q3 estimates, which kicked off a fresh rally in Micron shares above $60. The question on my mind, and on many investors’ minds, is simple: do we take the ~50% year-to-date gains on Micron and run, or do we hold on in the hopes of further appreciation? In my view, the Micron rally still has plenty of legs. In addition to the catalysts coming out of Micron’s Q3 guidance revision, including the updated NAND/DRAM market predictions that Micron’s management made during its analyst day (covered in a prior article), Micron has several other drivers beyond the incoming Q3 results that can propel shares even higher, which we’ll discuss in this article. Also consider the fact that while Micron has enjoyed the strongest performance of any of the major memory stocks thus far in 2018, it’s also still the cheapest. 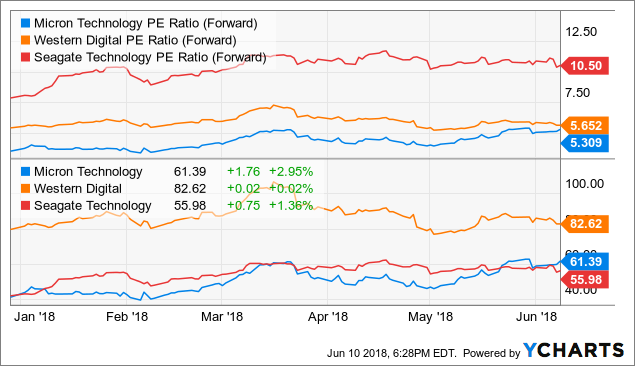 From a forward P/E perspective, which is how most analysts view Micron and the memory space, Micron is still a touch below Western Digital (WDC) and substantially lower than Seagate (STX). The divergence to Seagate’s valuation is perhaps most startling of all – Micron is a thought leader that has just started shipping its next-gen 3D NAND product, while Seagate is primarily an HDD manufacturer with little prospects for growth. I’m holding out for Micron to touch at least $100 before letting go of the shares. It’s not an arbitrary round number that would inflate the stock’s valuation – note that analysts’ EPS targets for this year and next have moved up over the past month as Micron itself revised its guidance ranges. Wall Street is now expecting $11.56 in EPS for this year and $10.86 for next year, according to Yahoo Finance. A $100 price target would still imply a cheap single-digit P/E ratio of 9.2x against FY19 EPS estimates, and implies 64% upside from current levels. If it sounds too good to be true, consider the fact that the reason memory stocks trade at such low P/E multiples is that, like auto stocks, the memory market has been known to be highly cyclical. In Micron’s latest memory market update given during its May analyst day, however, it has noted that supply growth will be slightly moderated compared to what it had originally expected, and that demand growth (on a “bits” basis) will match supply growth. Micron expects supply growth of 20% in DRAM against 20% demand growth; as well as 40% supply growth in NAND against 40-45% demand growth. This implies a balanced market and stable prices. If the memory market has matured such that it no longer has the dramatic peaks and valleys in pricing as in the past, then memory stocks’ P/E multiples can normalize as well. A 9-10x P/E multiple for Micron, in my view, is only a small step in that direction. Stay long. If you’ve paid even an iota of attention to Micron over the past several quarters, you’re well aware that the company has been able to drive massive earnings growth organically – that is, through pure revenue and operational improvements alone. Last quarter, Micron’s Q2 EPS of $2.67 represented 4x growth over the prior Q2. Well, Micron’s May 21 announcement of a new $10 billion buyback program is about to add some extra fuel to Micron’s EPS growth capabilities. Micron’s EPS growth has essentially been achieved in spite of the increase in share count, and this upward creep in shares is about to go in the reverse direction. With an open-ended $10 billion buyback program, Micron has the capability to buy back 14% of its current market cap of $71 billion. Put another way, at its current share price of $61, if Micron were to deploy the full $10 billion it could immediately retire 164 million of its current 1.159 billion shares and produce about 16% “inorganic” earnings growth through share count reduction. This $10 billion buyback isn’t just management blowing smoke, either. Micron is fully capable of financing this buyback through the $8 billion of cash on its Q2 balance sheet as well as the $3.8 billion in free cash flow it generated in the first six months of FY18 (Q1 and Q2) alone. Micron has newly committed to returning to shareholders at least 50% of FCF along with its new buyback program. In essence, I think of the new buyback program as a fail-safe for if/when NAND and DRAM prices do cool off. In the event that Micron sacrifices a bit of margin and sees earnings growth headwinds from the operational front, it can still rely on its huge buyback program to drive positive y/y EPS comps. Analysts’ EPS estimates for FY19 imply a -6% contraction – Micron’s buybacks could drive this figure to positive even with slight memory pricing headwinds factored in. NAND has always been the lesser portion of Micron’s business, with DRAM taking up two-thirds of its revenues. But Micron’s late May announcement that it began 3D NAND shipments in partnership with Intel is also worth mentioning. 3D NAND has long been awaited in the industry as it allows for the capability of stacking more memory chips in a smaller space. As envisioned by Gordon Moore of Intel years ago, the goal of semiconductor manufacturing is the continual improvement of packing more and more computing power into a smaller and smaller space year after year. 3D NAND allows manufacturers to stack memory chips vertically within the memory unit, unlike 2D NAND where memory chips are consolidated into a single flat layer, eating up space. Bit growth in NAND shipments beginning in Q3 and beyond is another major driver for Micron’s earnings that may not yet have been factored into analysts’ expectations for EPS decline next year. Despite the robust performance of Micron shares year to date, the company still has plenty of room left to rally. Aside from Micron’s expectation of a stabilized memory pricing environment driven by balanced supply/demand growth, the company is also supporting its EPS growth via a huge new buyback program and new product launches (3D NAND) that can greatly increase its bit shipments. Micron remains one of the truly value-oriented plays in the technology sector, and it even looks cheap against other undervalued memory stocks. Investors are encouraged to continue building a position, especially as upcoming catalysts (Q3 earnings) may prove to be another strong upside catalyst. Disclosure: I am/we are long MU, WDC.